Alzheimer's is a disease that robs people of their memory. At first, people have a hard time remembering recent events, though they might easily recall things that happened years ago. People with Alzheimer's might forget their loved ones. They might forget how to dress themselves, feed themselves, and use the toilet. The disease makes brain tissue break down over time. It usually happens to people over age 65. A person can live with Alzheimer's disease for just a few years or for a few decades. More often, however, people live with it for about 9 years. About 1 in 8 people age 65 and over has the disease. Women are more likely to have it than men. Nerve cells get tangles, called neurofibrillary tangles. 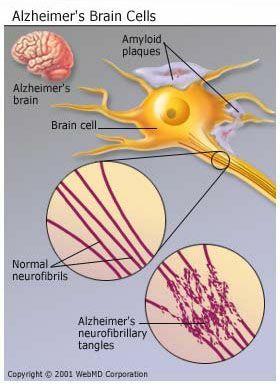 Protein deposits called beta-amyloid plaques build up in the brain. Researchers aren’t sure what causes this damage or how it happens, but it could be a protein in blood called ApoE (for apolipoprotein E), which the body uses to move cholesterol in the blood. There are a few types of ApoE that may be linked to a higher risk of Alzheimer's. It could be that certain forms of it cause brain damage. Some scientists think it plays a role in building the plaques in the brains of people with Alzheimer’s. Whether or not ApoE partly causes Alzheimer's, genes almost certainly play a role in the disease. Someone with a parent who had the disease is more likely to have it, too. There is some evidence that people with high blood pressure and high cholesterol have a greater chance of getting Alzheimer's. More rarely, head injuries may be a reason, too -- the more severe they are, the greater the risk of Alzheimer's later in life. Scientists are still studying many of these theories, but it’s clear that the biggest risks linked to Alzheimer's disease are being older and having Alzheimer's in your family. American Association of Family Physicians. The U.S. Food and Drug Administration. American Federation of Aging Research. Peter Doskoch. Neuropsychiatry Reviews, October 2000.